Not a good beginning for a bulb, to have an unwritable and unpronounceable name. This is a survivor though and worth a mention for any garden. I was given this bulb along with a host of others, by Johnny Walkers Bulbs (superbly successful gold medal winners) to trial in the gardens. Last year I noticed it had made a good clump and rashly divided it in the green, that is, just after it had flowered. In spite of this, every bulb has flowered and I have introduced it into short grassland where it looks as happy in the sunshine as the shaded border it came from. For us, a tulip that not only survives but actually bulks up is a wonder. It has a great deal of charm particularly amongst other early tulips which seem too large for their short stems. This is gracefully tall (15cms) and with a flower reminiscent of the fading crocuses around it. Identifying this bulb is not easy. 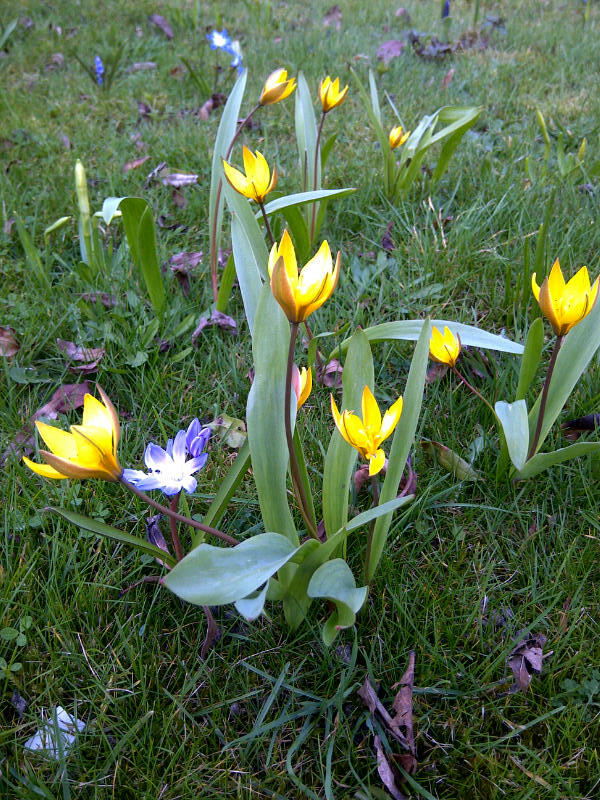 It came to us as Tulipa neustruevae ‘February Gold’ but I cannot find a mention of named varieties. On the internet, some agree with the look of my bulbs, yellow on tall brown stems with brown colouration on outside of the petals, but others opt for pure yellow, floppy stems etc. It is undoubtedly closely related to Tulipa dasystemon syn. T.tarda but comes from lower down the slopes of its native Tien Shan (more of which to follow.) An Australian nursery catalogue suggests that it likes dry acid sandy soil in warmer areas. We have cold alkaline soil but it is dry and free draining. Now, this description of plant places of origin. It’s all very well saying it comes from the Western Tien Shan in Central Asia but so do circuses, wars and sometimes, Michael Palin, so it’s not very helpful. I look up Tien Shan and its habitats.My initial research takes me to Wikipedia where I can just about work out from all the geographical data that the Tien or Tian Shan is a huge mountain range covering 6 or 7 countries. Not much information there for the gardener except this little nugget – the lower slopes of the Tien Shan contain forests of wild walnuts and apples. How evocative. Immediately I get a better picture of where my little tulip might grow. Lower mountain slopes, probably shortish on soil and by the forebears of trees that grow in my garden. A little more delving around a travel site reveals that it is full of ‘warm-hearted locals,’ alpine lakes and canyons. There is plenty more research to do but by now I am really taken with this little fellow who may grow along alpine passes crossed by smiling nomads. I plan to spread him through the gardens under the walnuts and the new apple orchard we plant this autumn. Sources for this bulb include Broadleigh bulbs and Pottertons Nurseries.